FORT WAYNE, Ind. 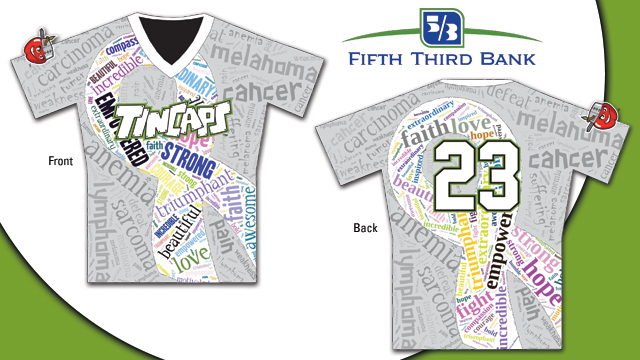 - The TinCaps are pleased to announce Cory Dold as the winner of the Fifth Third Bank Design-A-Jersey Contest. Dold's design was one of five finalists fans voted for last week on TinCaps.com. Fort Wayne will wear the jersey designed by Dold when the team hosts the Great Lakes Loons on Wednesday, August 20, at 7:05 p.m at Parkview Field - a night presented by Fifth Third Bank devoted to raising funds and support for cancer awareness. Dold's jersey features a large white cancer awareness ribbon on both the front and back. Inside the ribbons are words like fight, hope, and strong written in colorful fonts. The jersey also reads TinCaps across the chest and includes Fort Wayne's apple logo on the right sleeve. "The words in color shaped as an awareness ribbon depict the awe of the survivor and their support team overcoming the gray muted mass that is cancer and the destruction it seeks," said Dold, whose mother Kandy is a breast cancer survivor. Dold, 28, of Auburn, Ind., added that he's always admired his mom's strength, but especially so when she was battling cancer three years ago. "She never let on fear or weakness," Dold said. "She never passed on any fear or anxiety to our family." For that reason, Dold is proud to be able to pay tribute to Kandi's courage with his winning design. Dold said he submitted his design spur of the moment after hearing a relative tell him about the contest and then seeing it on Facebook. He said he didn't have any expectation to win. Now that he has, it's a bit of a shock. "It's exciting to win," said Dold, who's married and has a 2 ½-year-old daughter. "The design shows what I feel. It'll be cool to see it on the field." Dold, an alumnus of Fort Wayne's University of St. Francis, is a photographer and runs his own business, 4Ever Photography and Design, but admitted this may become his most publicly visible work yet. "We had a great response from fans for this contest and were fascinated by the artwork and stories behind each design," said Michael Limmer, TinCaps Vice President - Marketing. "Cancer affects everyone in some way or form and this contest has been a great opportunity for us to put the most visible part of our team branding - our jerseys - in the hands of our friends, family, and community who have all been touched by this disease. We are very proud that we will be wearing the jersey designed by Cory and voted on by our fans when we take the field on August 20." During Fort Wayne's game against Great Lakes on August 20, the Dold-designed jerseys will be auctioned off to fans with all proceeds benefiting a local non-profit organization serving people with cancer and their families. "Cancer is something that affects everyone at some point in their life," said Steven Alonso, regional president of Fifth Third Bank's Central Region. "We're thrilled at the response to this jersey design contest because it indicates how important cancer research is to our community. Having the chance to see this jersey at Parkview Field will be another great reminder of how we're all in this fight together."